This post contributed by Darrell Grant. When I received the invitation from PDX Jazz and the Portland Art Museum to present a concert in honor of International Jazz Day, I knew immediately that I wanted to tie the performance closely to the Constructing Identity exhibit. This expansive exhibition is a powerful lens through which to view over a century of African-American formation, exploration, and reinvention of identity—much of it in the face of dehumanizing racism and oppression. I was particularly interested to explore the ways that the work and narratives of the exhibit artists intersected with those of 20th century jazz artists—to find commonalities between the musical and the visual. It was daunting trying to choose from among the bounty of historic painting, sculpture, printmaking, tapestry, and collage in the exhibit, not to mention the hundreds of notable jazz composers I might pair them with. However, over the course of several visits to the exhibit, a program began to take shape. I started with pieces that spoke to me personally. There were several whose subject matter, imagery, symbolism, or stylistic approach “struck a chord.” Then I went through the exhibit and read all the captions accompanying the works. As I began to settle on a subset of artists to explore, I took to the Internet to research their histories and related work. I am a layman when it comes to art history. Perhaps for that reason I thoroughly enjoyed this process of discovery around both the iconic artists and contemporary practitioners. I found the range of cultural backgrounds and influences fascinating. I was interested in the differences in formal training and the extensive travel that many of them undertook that enriched their educations and their practices. I have read many similar things in the biographies of jazz artists. Not surprisingly, many of the visual artists were products of major urban art scenes in New York, Philadelphia, and Chicago, cities that were also centers of jazz musical innovation. I was intrigued to read about the influence of artist collectives and informal groups or “schools” on the development of individual artists’ practices. These too, had parallels in jazz, including the Association for the Advancement of Creative Musicians (AACM) in Chicago and the Black Artists Group (BAG) in St. Louis. It was also interesting to note how many of these artists reacted to, and participated in historic cultural moments such as The Harlem Renaissance and the Civil Rights Movement in similar ways to their jazz counterparts. Once I selected my composers, then I got to pursue the most enjoyable part of the process: identifying jazz compositions that might resonate with specific visual art. In this process I was aided by the fact that music and visual art share a wide swath of descriptive language. These range from stylistic categorizations like impressionism and abstraction, to descriptions of mood like “bright” and “dark.” In fact, the very idea of color as a musical characteristic reflects our penchant for describing music in visual terms. Similarly, we talk about the “balance” of a composition or a painting, the “contour” of a drawn or melodic line. In describing visual art we also hear references to elements of jazz like improvisation and rhythm, as well as vernacular terms like “soulful, “bluesy, and “jazzy” as a way of getting closer to the essence of the work. I tried to use this common language as a way of listening and seeing, in order to discover what the music and the art might have in common. The musical selections in the “Sound of Identity” range from classics of the jazz repertoire to contemporary works. 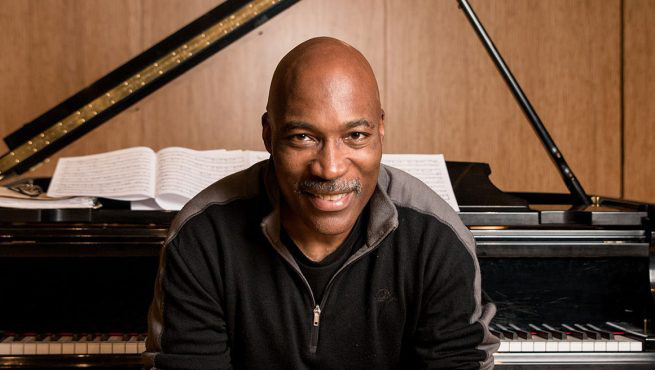 Likewise, the composers include icons like Ellington, Monk, and Mary Lou Williams, to contemporary jazz artists like Terence Blanchard and Marcus Shelby. Like the exhibit’s visual artists, their works express multi-faceted identities and artistic visions that are shaped by the many “hats” they wear—as performers, composers, teachers, mentors, leaders, activists, learners, and collaborators. They come from a range of ethnic, cultural, and class backgrounds, and create from a myriad of influences, personal narratives, and artistic points of view. Some deal in abstract subject matter and seek to explode established forms. Some take programmatic approaches and create aural “landscapes” of sound. Others highlight the vernacular, or even the overtly political in their work. What is universal is their quest to be seen as individuals, to have their unique stories and perspectives represented, and to make space within the culture for a larger range of experiences, ideas, and expressions. One of the historic challenges of African-American artists is that of straddling the line between high art and vernacular/popular culture. Historically we have striven to expand the perception of our work idiom to embrace both. At the core of Constructing Identity is the assertion that “African-American art is American art.” The artistic voices of our community are, and always have been, intrinsic to the construction of American identity. The exhibit also encourages viewers to move past simplified racial constructs of “black” and “white” to see these artists for their singular contributions within the framework of American culture. Studying the exhibit and creating this concert gave me a deeper appreciation for the diversity of African-American narratives and the myriad cultural and personal identities that are so often overlooked in discussions around race. This “Sound of Identity” concert program is an attempt to connect to the cultural expressions and experiences that inspired generations of visual artists and musicians, as well as to highlight the quest for individual identity that we all pursue within the larger communities to which we belong.